When writing up the rules for your Weight Loss Challenge there are a few things to include to make sure the Challenge is fun and fair for everyone. Your rules will need to be adapted to your workplace, family or friends needs. What’s Inside the Weight Loss Competition Rules? Make sure the rules include dates and times for signing up. The rules should also have a detailed outline of what is expected for the registration fee, who is looking after the money, and prize payouts. Other considerations can include who can and cannot participate, liability issues, and administrative needs required. ==>> Download our fill-in-the-blank Weight Loss Challenge Rules ~ FREE! Workplace Challenges can be fun but no one wants to overstep the personal boundaries needed in the workplace. A person can be very sensitive about their weight and their weight loss so how these numbers are recorded needs to be respectful. People in charge of the weigh-in should be someone everyone will be comfortable with knowing their weight. The workplace should offer a Challenge without demanding participation. Limited time offer * FREE Today * Immediate download! Once you have determined how the Challenge will be scored, the teams need to be divided fairly. Men, women, weight class etc. Other important rules to ensure fairness include selecting team leaders and judges. Fairness can also dictate what to do if someone drops out and be specific on what can disqualify a participant. If the Challenge included group fitness programs, make sure they are accessible for all fitness levels. Prizes need to be great for whomever wins and not be size or gender specific. All disputes need to be decided by an impartial judge chosen prior to the beginning of the Challenge. Would like a copy of our fill-in-the-blank Challenge Rules, that you can modify for your own Challenge? Just go to this page and fill in your email. You will receive 5 pages of RULES that can be used for work groups, friends, or family. Great! Please let us know what you think of them. 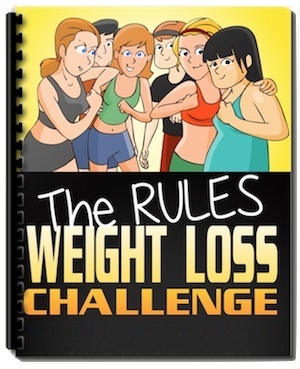 Also, if you have any rules you think can be added let us know and I will make sure they are added to the free download Weight Loss Challenge Rules here. please send weight loss challenge ideas for the workplace. would like the challenge rules for my families 90 day fitness challenge. Can you send me an email of the 5 pages for this 100 day Challenge? ‣ Think You're too Busy? What Are Some Weight Loss Challenge Ideas? What Are Good Weight Loss Challenge Fitness Games?